Become the richest and largest bazaar merchant in Cairo. 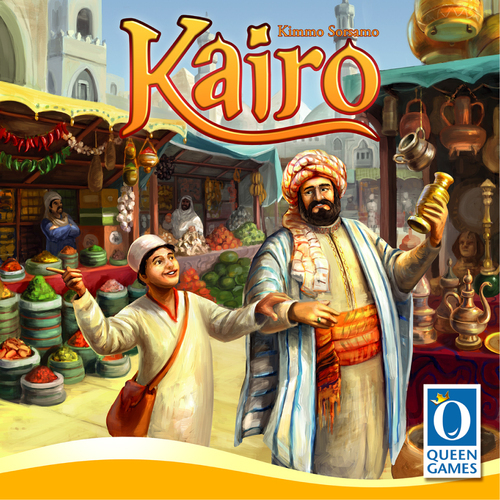 Kairo is another game from Queen Games with colorful tiles and multiple colors of money. In addition this game brings six customers into play each a different color. 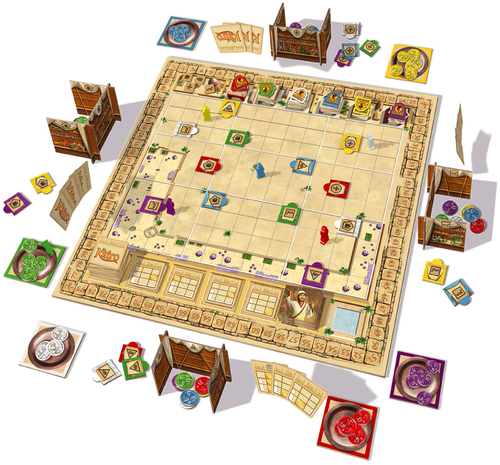 Each player starts the game with three different market stalls (out of a possible six) placed in the market area. Throughout the game players will place additional stalls and expand their existing stalls at a cost, of course. Points are gained by increasing the size of your stalls. In order to pay the cost of placing more market stalls you must earn money by luring customers to your stalls. Market stalls, money and customers all come in six different colors. The key to success will be to lure the right color customer to the right color stall. An interesting twist in the game is that only five of the six customers are available in the market at a given time. When a customer (say red) reaches a market stall that customer (red) is replaced by the customer (say white) currently absent from the market. Therein lays the challenge, luring the color of customer you need to your market stall of the respective color. The color of money is important because it is most cost effective to use the same color money as the color of the market tile being placed than to spend different color money. Not only do players score for adding to their respective stalls but bonus points are earned for building the largest stall of a particular color. Space in the market is limited so grab the best sites early, lure as many customers and expand wisely to gain the most victory points and victory. This is a game that is very tactical and has more going on that it originally appears. We have an open copy of Kairo available in our Store Demo Games Library for you come in and try.